The Vivekananda Kendra, which has been working on “Green and Clean Rameswaram” project, giving fresh lease of life to ‘theerthams’ (venerated water bodies) in around the island, has renovated the 200-year-old Mohabeer Dharmasala, preserving the antiquity. 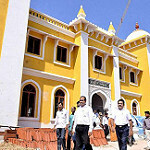 The massive structure built by a Maharashtra-based businessman, near the Railway Station, was vandalised and presented a picture of neglect after it remained shut for nearly 12 years, when the Kendra took up its renovation by engaging Puducherry-based conservation architect Asaithambi Gurusamy. The Dharmasala, in which Maa Sarada Devi, the spiritual consort of Ramakrishna Paramahamsa, had stayed, wore a new look now with fresh coat of paint and all set for inauguration during the middle of this month. It was renovated at a cost of Rs. 1.37 crore. “We have renovated the whole structure using lime mortar, one of the oldest types of mortars and Madras terrace roofing, the traditional flooring technique practiced in south India to preserve the antiquity,” Mr. Gurusamy told The Hindu on Friday when Collector S. Natarajan inspected the renovation work. 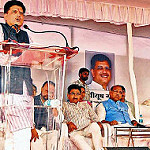 When the 8,500 sq ft ground and first floor structure was shut for about 12 years, it was vandalised and the wood and rafters were stolen, he said. “Nearly 50 per cent of the roofing was not there and we renovated the roofing with its originality,” he said. The original building had 11 rooms at the ground floor and three in the first floor, mainly for the business community to stay after offering worship at the Sri Ramanathaswamy temple and they have converted the ground floor into an open air auditorium. The auditorium would be used to showcase the folklore of Rameswaram, its unique culture and landscape of the island through drama, short film and puppet shows, Mr. Gurusamy said. The auditorium could accommodate about 70 pilgrims and the shows would be organised daily, he said. The Kendra was implementing ‘Green and Clean Rameswaram project’ under the Natural Resources Development Project (NARDEP) and the structure was renovated under the project, V. Saraswathi, Project coordinator, said. Vivekananda Kendra Kanyakumari, Paschimbanga Prant organized the International Yoga Day Celebration in many places. 1 : VK- Durgapur Branch organised at Samskar Varg, at Shri Shri Hari Chand mandir, gantantra colony. Toatal 30 students paricipated. # 400 students are particpated in IYDC at T. N.High school, Durgapur. # 113 participants are present at the Ramkrishna Vivekananda Mission Federation school at Uttarpally, Durgapur. # 87 participants are present at Banbihar Primary school at mamra bazar, Durgapur. 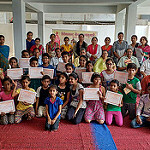 # At Yoga Varg (sisters) total participate 9. 2 : On the auspicious occasion of International Yoga Day, Vivekananda Kendra Kanyakumari Kolkata Mahanagar organised International Yoga Day Celebration at IIM KOLKATA. 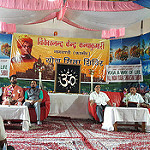 It was conducted by Dr.Arun Upadhyay (Prant Sah Vyavastha Pramukh) with Shri Ramesh Mundra (Sampark Pramukh, Vivekananda Nagar), Smt.Sarita Sehgal (Vistaar Pramukh, Hatibagan), Manish Pandey (Sanskar Varg Pramukh), Ku.Malti (Sampark Pramukh, Malda), Ku.Shubhangi Upadhyay (Vistaar Pramukh-Shalimar). 70 Students along with the Faculty Members & the Directer of IIM Kolkata participated in the programme. 3 : VK-Loknath Nagar Celebrate IYD at Arpita Apartment, Rajarhat, total 11 participants present. 4 : VK-Salt Lake Yoga Varg celebrate the IYD at Central Park, Salt Lake. Total 110 participants present. 5 : Vivekananda Nagar Yoga Varg celebrate the IYD at VK-Kolkata karyalay. Total 7 participants present. 6 : VK-Bolagarh celebrate the IYD at Bolagarh. Total 15 participants present.